I wish we had won—had held on in the ninth; had played Game 1 of the National League Championship Series against the San Francisco Giants last night; had had a shot at the World Series. But as the pain of Friday night subsides and detachment comes more easily, an undeniable fact emerges: the Nationals, and Washington, needed this. In fact, the gut-punch of a loss may have been the best possible thing that could happen to the capital city’s nascent baseball culture. It’s not just that lousy experiences create lasting bonds generally, although they do. It is that baseball, particularly and peculiarly, demands past heartbreak to create a lasting link. Only in baseball could fans of a team (the Chicago Cubs) practically pride themselves on perennial haplessness or fans of another (the Boston Red Sox) list all the times they came so close and collapsed in the end. Those boorish Phillies fans feel the pain of years of futility–which is one reason why they’re willing to make road trips to see their team on the road during years when it’s good enough to sell out at home. Other than the New York Yankees, Major League Baseball’s hegemon and heel, every team worthy of devotion gathers its fans with an underdog narrative. But for their first seven seasons, the Nationals did not fit any of these categories. They were just crappy or mediocre. And then after that they were awesome. There was never texture. Though Washington is technically an older city, and nearly a northeastern one, the pattern of the team–playing in a stadium full of transplanted fans who often cheered on visiting teams who came from wherever they called home–had a Sunbelt vibe: More Miami Marlins than Chicago Cubs. Fans were bandwagoning at best, and at worst just complacent. That may not be possible anymore. 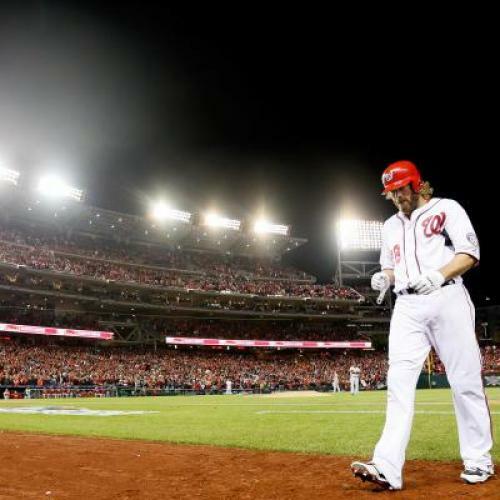 The Nationals have had a defining season and a defining, wrenching loss. There is a common memory for the transplants to share: Twice, they were a strike away from winning. Once they come out of their gloom, I suspect that Nationals fans will no longer need crutches like Take Back the Park to lean on. And they will no longer have the cheap thrill of oodles of regular season victories: following every win, we will recall what Friday night felt like. Doubtless this will turn some off, and the bandwagoners will be filtered out while the new fans (who may resemble bandwagoners in their first season) will remain. This is a good thing. “It is designed to break your heart,” former MLB commissioner A. Bartlett Giamatti once wrote of baseball, in prose whose lavender hue no longer seems to me unfit for the subject. Until this season, the Nationals had never been exciting, and until Friday, they had never been heartbreaking. Now, they emanate hope and bitterness—the two essential ingredients of baseball fandom, particularly in a city that by itself does not have much of either.